THE DROP ZONE TO LEAVE SERVICE IN 2008 TO MAKE WAY FOR THE STAR BURSTER! 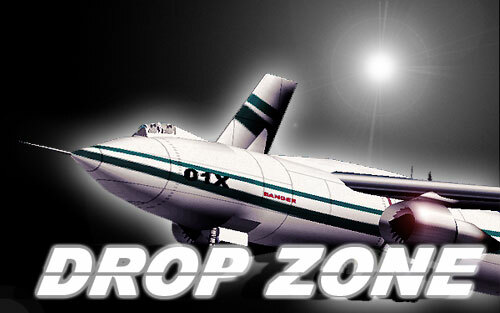 Important Notice: The MoTIS DROP ZONE as a true experiment lift line-VECTOR THRUSTING aircraft has proved to be to aerodynamically unstable as a truly practical launch platform for our ORBIT ZONE space mission as a piggy back lifter aircraft. So it is with sad regret that we will be decommissioning this fine aircraft. The DZ will be out of full development and production in the early part of 2008. the aircraft will not play any additional roles in the online flight market and she will be placed in the MoTIS virtual museum as an experimental class aircraft. The SUN BURSTER will take over all the stable launch programs that we designed for the DZ as the SUN BURSTER is suited to STABLE launch and recovery mission. 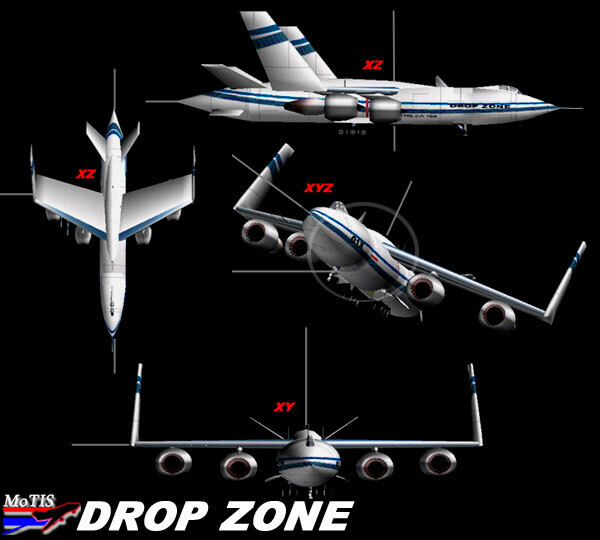 The MLPT-JX6 DROP ZONE is the next wave of modern shuttle carrier aircraft (SCA) and airborne launch systems aircraft. This great neo concept aircraft will preview the new neo concept tailless technology experimented on by the SR. MoTIS design and CAD engineering staff. The DROP ZONE is a version of the STAR LIFTER SERIES and there are 3 more of these aircraft in our hangars at the moment all with two variants to each group! The MLPT-JX6 DROP ZONE represents one of the first-generation of aircraft to be released out of the MoTIS Aerospace Networks! The DROP ZONE is a super transport aircraft that has been designed in several variants that will allow for the safe transport of numerous types of neo concept orbital vehicles! This aircraft is designed to act as a primary launch platform for our SKY STREAMER program and to act as a super high altitude space refueling platform as well as conventional aircraft refueling station. The DROP ZONE is designed and developed to be a super space platform aircraft that will be able to carry multiple mission load outs and serve as a super aerial refueling platform! The DELTA CON SLED SYSTEMS are a long labored neo concept design project that MoTIS CEO O WATSON has been working on since childhood. This is a system of reusable large boar lifter aircraft that are all part of the MoTIS PIGGY BACK lifter series of neo concept designs. You might say what's the big deal about this lifter series, well the big deal is that in the design cost analysis team MoTIS has found a super space rely delivery system that would lower the cost into the stars by over 40% on big transport aircraft like the space shuttle!!! The realization of these types of capital resources would be Hugh if a space program like NASA were to find a way to successfully integrate this type of technology into the current planned smaller but still large enough to be load intensive reusable space systems. The design history of this aircraft is very interesting but until the whole aircraft is totally declassified we can't report on that as of yet.. Its primary mission will be ferry the space craft CONVOY and the other neo concept space craft that we have in the other hangars at X-ROW and provide for a first stagy piggy back launch aircraft in the PIGGY systems development program at MoTIS..... The MLPT-JX6 DROP ZONE is the sole design accomplishment of O Watson and Jen Guess. A NEO CONCEPT THRUST VECTORING SCA AIRCRAFT! This aircraft is thrust vector assisted by two fully variable thrust vectoring neo concept developed engine systems called the TM VECTOR SOMA. The aircraft is fitted with a full tail down thrusting system independent of a full tail assembly that would under normal circumstances provide all the tail down force needed to keep any aircraft in the sky! AIRCRAFT WILL USE THRUST VECTORING FOR LONGITUDINAL STABILITY WITH SMALL ELEVATORS FOR INCREASED STABILITY DUE TO THE MISSION OF BEING A SEMI LAUNCH PLATFORM FOR ROCKET ORBITAL AIRCRAFT!!! A FULL AIRCRAFT VARIANT NETWORK COMING SOON! THE DROP ZONE ON THE FIELD FOR THE FIRST TIME AT KATL WHERE WE TESTED HER AFTER ALMOST A YEAR IN THE DEVELOPMENT PHASE!!! The SKY STREAMER PROJECT is a MoTIS mission project designed to integrate the Lift body concept into the current state of space transport aircraft . The DROP ZONE can be modified to transport large space craft like the CONVOY or used as a standard drop test bed for the SKY STREAMER PROGRAM. The SKY STREAMER PROJECT will consist of numerous aircraft designs, only a few of which are in preview below!